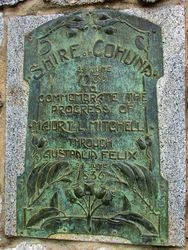 The cairn commemorates Thomas Mitchell's passing through the district in 1836 during his exploration of Australia Felix. The cairn was unveiled during the centenary year of his visit. 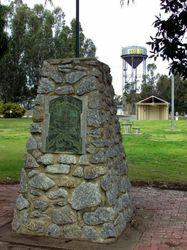 At the unveiling of the Bulla memorial for Hume and Hovell,Charles Daley the Secretary of the Victorian Historical Society suggested that the idea be extended to other explorers and a committee was formed to mark out the routes of Charles Sturt, Thomas Mitchell, Angus McMillan, and Count Paul de Strzelecki. The Major Mitchell Cairn was unveiled in Cohuna on the 24th June 1936 during the celebration of the 100th anniversary of his passing through the district. The bronze plaque with vignettes of gum leaves was designed by Mr S Chambers, headteacher of the Cohuna State and Higher Elementary Schools. The cairn was unveiled by Mr C.R.Long who performed the ceremony as the representative of the Historical Memorials Committee. The Cohuna Cairn was constructed with granite from Mount Hope. The cairn also marked the district where Major Mitchell made the decision to turn south and discovered new fertile country for colonisation. Major Mitchell was the first white man to pass over the site of Cohuna. The Argus, 25th June 1936.